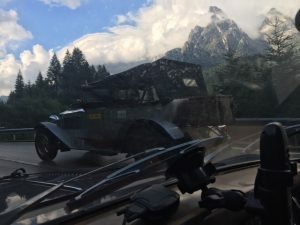 As we do the final miles into San Martino we catch a few of the vintage cars – Max and Julie in the Vauxhall, an Alvis, one of the Bentleys, and for the first time we actually pass the Rolls Royce on the road – the others are not so easy to pass. Following these cars in the sun did make me wonder how they had got on in this mornings hailstorm. As we were waiting for the start at one of the stages just after the storm I had seen what was obviously the driver of one of the open cars come up alongside the Jag to talk to the marshall. The conversation was a bit of a moan to the marshall about the weather – though I’m not sure what he is expected to do about it. 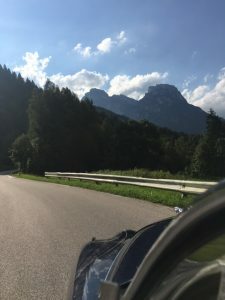 But the image that will stick in my mind is that of this leather jacketed and gloved driver, identity unknown to me as he was standing up against the far side of the Jag and I was driving, and the water not dripping from the tips of his gloved fingers but actually pouring like a tap. How do you even dry the jacket and gloves overnight? 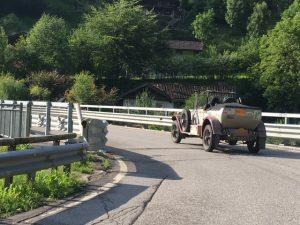 Whatever complaints of tiredness and stress that I have heard from any classic car driver pretty much pales into insignificance compared to what these guys go through. What were they thinking!